I was open to the idea; however, she really didn’t give me much of a notice! I live in Umatilla, Oregon and there’s literally NO shopping stores here!!!! There are a few stores in Hermiston, Or, which is about 7 miles from my home; however, those stores do not have any fabrics, crafts, or patterns that suit our needs. So, why I am telling you all of this? Primarily, I want you to get an idea of how much pressure I was under making this “very easy” McCall’s pattern with only 2 days to find a pattern, wash the fabric, and sew the dress. Notwithstanding, I was up for the challenge and decided to try and make her something very easy! I had very little time to not only sew my daughter a “stretchy wrap dress that she can dance in,” but I also had to find a “wrap dress” pattern. So I went to the local Walmart in Hermiston, Oregon (remember Hermiston is about 7 miles from my house, and it only has a population of 17,000 residents). Finding a wrap dress pattern at my local Walmart would be next to impossible, because it is a very small Walmart and it doesn’t have much in the way of fabrics and crafts. On Wednesday morning, I went to Walmart and searched their very merger pattern collection. Among their “Easy Stitch ‘n Save” patterns by McCalls I found this cute mock wrap dress pattern; it was the last pattern. It’s not your traditional wrap dress in which you would open the dress up on both sides of the dress. It is a close-fitting pullover mock wrap dress, which only opens on one onside of the body. I know! I was so disappointed, at first. But I fell in love with several of the variations and I absolutely love the simple details. Besides, I couldn’t find a traditional wrap dress among the other patterns at Walmart. So, I made this one work! This pattern features four variations of close-fitting mock wrap dresses, which includes knee, midi, and ankle length dress options. The pattern also has a gathered right front for views C & D, tie ends, and narrow hems. The pattern also features three sleeve variations, which include short, long, and 3/4 sleeve variations. Since it is Fall here in the United States, I decided to make variation C. This view features a knee length mock wrap dress with 3/4 sleeves, a gathered right front, and narrow hem. When my daughter found out that this dress pattern was NOT a traditional wrap dress pattern she was not too thrilled about it. However, she loves this finished dress and is excited to get much wear out of it! For this project I used a lightweight rayon knit fabric that I purchased from Walmart. I was so excited when I pulled the fabric off the shelf, and I was even more excited when I saw how much the fabric cost! I paid $2.50 yd. for this gorgeous and vibrant fabric, and I purchased 3.5 yards of it. I’m thinking about going back to get more! The pattern calls for about 2 yards of 60″ wide fabric for view C. I found this to be quite accurate! Fortunately, I have about 1.5 yards of this fabric left after completing this sewing project. I think I’m going to make a dress top with the 1.5 yards that I have remaining. I didn’t walk into the store with the intentions to buy this fabric specifically to make my daughter’s homecoming dress. In fact, I purchased this fabric the week before my daughter decided she wanted me to make her a homecoming dress. When she first laid eyes on this fabric she fell in love and begged me to make her something with it. Once she asked me to make her a wrap dress, I made the decision to use this fabric because this fabric was perfect for this project. The pattern calls for moderate knits such as jersey, novelty, and cotton stretch knits. The pattern is exceptional. I love how easy and simple it is to make this pattern, and I like the multiple views this pattern has to offer. Because there are four variations featured in this pattern you would have several options for making a dress. You could make a dress with short, long, OR 3/4 sleeves. There’s also the option of making a short, midi, or long dress. Finally, you could make the dress with a slight spilt going down the middle front if you make variations A & B. There are just so many options! In addition, the instructions for making this dress are clear and succinct (you can read more about that below). There are two sets of instructions for this pattern. The garment construction for views A & B are slightly different than for views C & D. Therefore, the instructions are different as well. There are 14 steps for views A & B. Since I did not sew these two views yet, I don’t feel it’s necessary to comment on the instructions for those two views. However, I will say this… I did read over the instructions for these two views and they are very easy to follow andunderstand. There are 15 steps for views C & D, and the instructions are also very easy to follow and I had no trouble at all following each step. Honestly, I doubt that you would have any trouble following this pattern’s directions. I chose to hem everything at 5/8″ seam allowance and used a twin stretch needle (instead of doing a zigzag stitch). This pattern is sized for U.S. measurements (size 6-14); I cut a size 8. The finished measurements that correspond to this size are 33″ bust, 28″waist, 35″ hips. I didn’t do any alterations or adjustments. Generally, my daughter can fit almost any knit pattern as is. Sometimes, I need to raise the waist by an inch or so. Honestly, there’s nothing that I dislike about this pattern, except for the very low v neckline. I think the low v neckline is a bit much for my daughter; she wore a camisole underneath this dress. I felt like the pattern was very easy, the instructions were great, and I love the variations, especially the gathered front near the tie end. I just absolutely adore that little detail. I will most certainly make this pattern again! I would love to make one for myself next time. Mostly, I would raise the neckline a tad. It’s way too low! In the future, I hope to re-draft the front sections of this pattern and make an actual wrap dress though. This is a mock-wrap dress, which means you have to pull the dress over your head to put it on. Although I adore this style, I would like to also make a traditional wrap dress, one that opens up on both the right and left side of the body. My recommendations for this pattern are to (1) Pay close attention to how you sew the two front sections to the back section of the garment. I went into the project thinking this would be a traditional wrap dress, so I forgot to sew the left front section to the right front section (to create the appearance of a wrap dress). That caused a minor hiccup for me. (2) Be sure to carefully read your pattern pieces and instructions . You will need to lay one of the front pieces facing up on your fabric and the other front piece you will lay it facing down on your fabric. (3) Be certain to make adjustments to the bust and front neckline area if you don’t like low cut dresses because the finished garment will show quite a bit of cleavage! 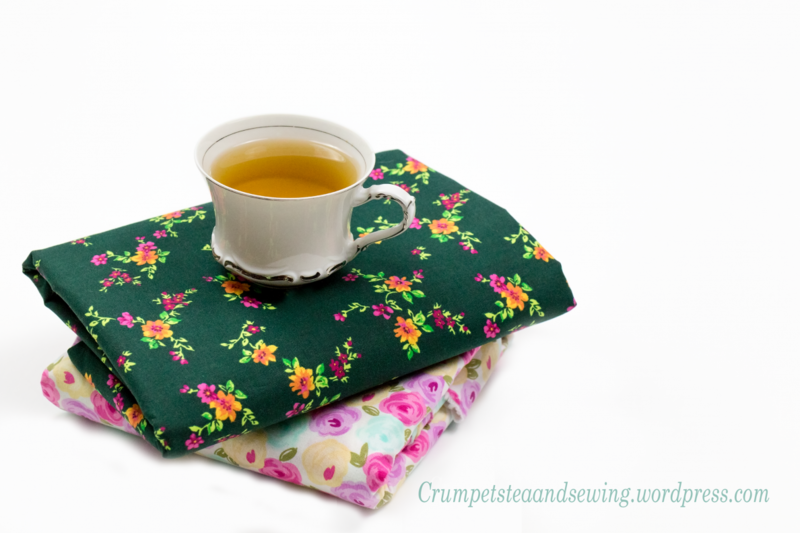 If you pay close attention to the instructions and the pattern pieces this will be a simple and easy sewing make that you can complete in one afternoon! Posted on October 8, 2018 October 8, 2018 by TeaPosted in Modern Makes, Special Occasion MakesTagged mccallspatterns, patterns, sewing, wrapdress. The dress is really beautiful, bravo! I love how thorough your review is. By the way, has this dress been in the wash yet? I’m asking because I have a lightweight rayon knit dress that grew in the wash and I’ve been avoiding rayon knit since, which is sad because I love rayons. I pre-washed the fabric before I cut it. But I haven’t washed it yet. But I’ve never had that problem with rayon fabrics. I love that fabric. I’m sure your daughter was lovely in it! I prewashed a rayon fabric and then sewed up a dress. It was just fine afterward! Yes! I’ve never had an issue with rayon knits. 😂 that’s funny! That would be an interesting world! No bloggers blogging hmmm. There’s a thought! I just saw you on you tube and love the purple and red print blouse . Nice job.